The hashtag #BlackGirlMagic began on social media to celebrate Black women and girls through shared images and ideas. “African-American Women: Our Science, Her Magic” was released Thursday during an event at the Congressional Black Caucus Foundation’s 47th Annual Legislative Conference in Washington, D.C. hosted by Congresswoman Maxine Waters. “We’re very pleased to have Nielsen present its new comprehensive report on African American consumers,” Waters said. This report is Nielsen’s seventh look at African American consumers and the second time the company has focused its attention on Black women. It includes never before seen data and consumer insights on Black women’s consumer preferences and brand affinities that are resonating across the U.S. mainstream. Nielsen estimates that the buy habits of Black women will drive Black-spending power toward a record $1.5 trillion by 2021. 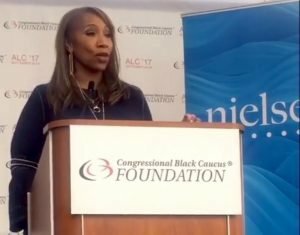 Cheryl Grace, senior vice president of U.S. strategic community alliances and consumer engagement at Nielsen offered statistics on Black women. “There are 24.3 million of us,” Grace said on Thursday. Black women over-index for time spent on social networking sites, using social media more for consumer engagement activities, and social movements adapting their use into communities such as #BlackGirlMagic. Facebook is the top social media site among Black women; however, YouTube, Instagram, Twitter, Google+ and LinkedIn are all used by a higher percentage of Black women than they are by total U.S. women. Both population and buying power of Black females are geographically concentrated, with 56 percent of Black women living in the South and 10 states accounting for 62 percent of African-American buying power. Black women are the majority owners in more than 1.5 million businesses with more than $42 billion in sales and $7.7 billion in payroll, making them the ultimate decision makers for purchases of supplies, equipment and raw materials, as well as employee benefit products. “Black women have strong life-affirming values that spill over into everything they do,” Grace said in a statement. “The celebration of their power and beauty is reflected in what they buy, watch and listen to, and people outside their communities find it inspiring. For more information and to download the report, visit Nielsen.com. VIDEO: Michael Eric Dyson Explains Why Diversity is Essential in the U.S.